Shields & Company, Inc. (“Shields & Co.”), a leading middle-market investment bank, is pleased to announce the recapitalization of Northeast Battery & Alternator, Inc. (“Northeast Battery” or the “Company”), one of the nation’s leading independent battery distributors. Northeast Battery retained Shields & Co. to assist in the evaluation of its strategic alternatives. This process resulted in a partnership with Colville Capital (“Colville”), a private investment firm based in Charlotte, North Carolina. Shields & Co. was able to structure a deal that satisfied the Northeast Battery shareholder’s objectives, while also giving Colville the opportunity to support Northeast Battery’s growth objectives via expansion into untapped geographies within the eastern region of the United States. Northeast Battery is an independent battery distributor with seven locations spanning from the U.S. – Canadian border to Virginia. Founded in 1985, the Company provides commercial and wholesale customers with a full range of batteries for automobiles, commercial vehicles, power industrial equipment, recreational vehicles, stationary power applications, and uninterruptible power supplies. Northeast Battery is the exclusive distributor of Trojan Batteries in the northeastern United States, and carries a range of other battery brands from leading manufacturers. The Company also offers a private-label line of batteries under the Ultrapower brand. Northeast Battery is headquartered in Auburn, Massachusetts. 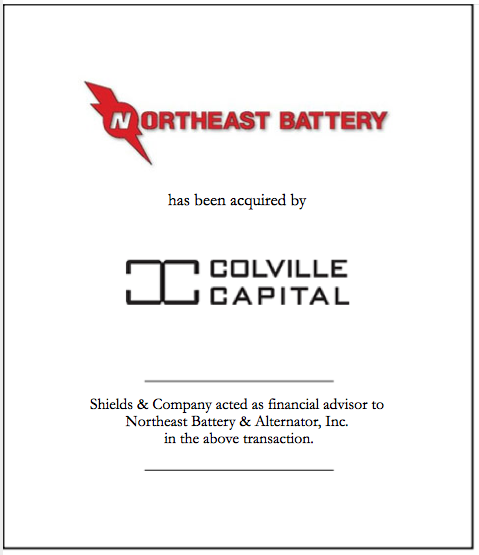 Shields & Company acted as a financial advisor to Northeast Battery & Alternator, Inc. in the above transaction.